This is another Japanese species that has a long history and which has had several different names. This species of small size (12 inches high) plants is found in wet soils in their native lands. Plants have wavy, shiny leaves about an inch wide and 4 or 5 inches long. The top of the leaf is a matte, dark green while the bottom is shiny and lighter green. Leafy bracts appear along the stem and near white flowers are borne in August. The flowers have dark purple veins in the tepals. According to The Hosta Handbook by Mark Zilis (2000), this plant has also been known as either Hosta albomarginata or Hosta lancifolia albomarginata in the past. 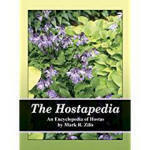 The Hostapedia by Mark Zilis (2009), states, "Unfortunately, it was designated as a species in 1838 and serves as the type for a large taxonomic group of hostas (Schmid 1991, p. 99). 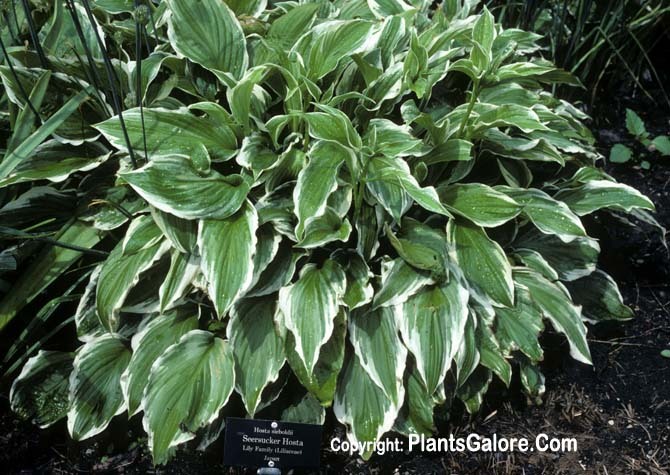 For this reason, George Schmid chose not to reclassify Hosta sieboldii as a cultivar. Instead, the green-leaved form found in the wild was designated a form of the species i.e., Hosta sieboldii f. spathulata (ibid, p. 104)." The species is named for famed plant explorer, Philip von Siebold. This plant may have been sold as 'Mackwoods No. 32'. Mark Zilis' Field Guide to Hostas (2014) states that this species was found in Japan in "...open grasslands near Mt. Fuji; woodlands; wetlands..."
An article by Hajime Sugata of Japan in The Hosta Journal (1994 Vol. 25 No. 2) states that "H. sieboldii* thrives in most habitats, such as in forest, wetlands, along the roadsides, and the edges of rice paddies. It is not widely spread, but mainly grows concentrated in Tsukude Village, Aichi Pref. and Ena Area, Gifu Pref. One of the most striking sights are in fields where these deep purple flowers stand out among the weeds. H. sieboldii is the dominating species there and occupies the more fertile soil. There are many regionally modified forms with different sizes and shapes. Neither a variegated form nor a white-flower form has been found in these areas." * At the time this article was written, H. sieboldii was incorrectly called H. albo-maginata and we have substituted the proper name to avoid confusion. An article by Bill Meyer in The Hosta Journal (2003 Vol. 34 No. 1) states that, "H. 'Sieboldiana'...Virtually the opposite of H. sieboldii, they add large leaves, rounded leaf shapes, rugosity and heavy substance. They are also the origin of the wax that makes green hostas appear blue and of lutescent yellow coloring (all other species produce viridescent yellow seedlings). Like H. sieboldii, they yield large quantities of seed...Slow growth and poor division formation are at the top of the list of negative traits. In addition, they flower early, at a time when few other species bloom, often adapt poorly to hotter climates, go dormant in the summer and lack new leaf production during the second half of the season. Some would consider them overused." An article about name changes by W. George Schmid in The Hosta Journal (2004 Vol. 35 No.3) says, "The first change affecting the genus Hosta is that Hosta sieboldii 'Albomarginata' is now the correct name for the hosta originally known as H. sieboldii 'Sieboldii' (and later by the name Hosta sieboldii 'Paxton's Original')."